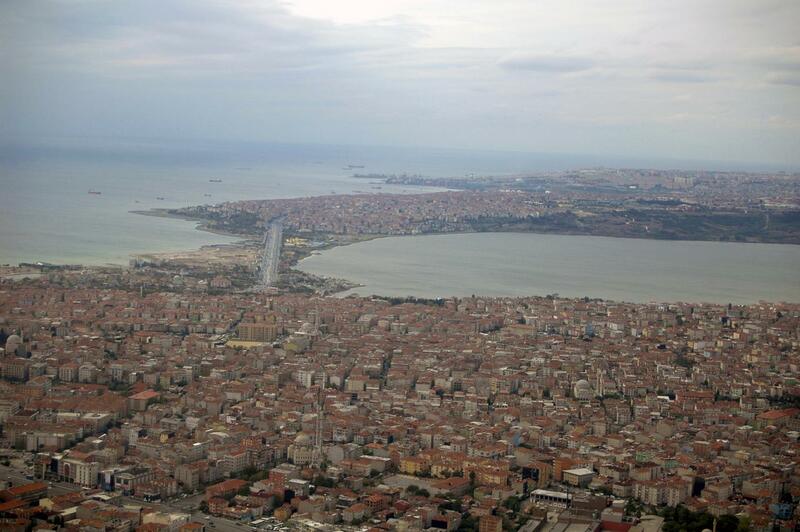 The metropolitan area of Istanbul with around 15 million inhabitants is considered to be particularly earthquake-prone. In order to be able to assess the risk correctly, researchers must decipher the processes underground. Now further progress has been made by an international team, to which Marco Bohnhoff from the GFZ German Research Center for Geosciences belongs. Below the Marmara Sea, they detected earthquakes that were not directly caused by tectonic stresses but by rising natural gas. Their findings are published in the journal Scientific Reports. The team led by Louis Geli of the French Research Center Ifremer analyzed seismic data recorded after an earthquake in the Western part of the Maramara Sea on 25 July 2011 with a magnitude of 5.1. As expected, several aftershocks occurred in the following days and weeks, but they were less severe. "A stronger earthquake changes the stress in the underground. This results in further shocks – so-called aftershocks – in which the stress changes are then compensated again," explains Bohnhoff. This happened in the summer of 2011 below the Marmara Sea near Istanbul. It was striking, however, that only a few aftershocks occurred in the crystalline basement where the main earthquake had its origin. "Instead, we recorded a lot of tremors at very shallow depths below the seafloor," says Bohnhoff who was involved in the localization and analysis of the shallow quakes. "This was quite surprising, because these layers consist of soft sediment that typically deforms aseismically under tectonic stress and does not make abrupt movements typical for earthquakes." In fact, there is another underlying mechanism, as the authors explain: The M5.1 earthquake has disrupted the stress field like striking a bell so that a natural gas reservoir in close proximity to the tectonic disturbance has come under increased pressure. As a result, gas escaped and moved upwards where it triggered weaker earthquakes. "Different processes come into question. Small shear fractures may have been activated, or the outgassing may have caused oscillations of water-filled cavities, a process also known from volcanoes or gas leaks. "The exact processes taking place below the bottom of the Maramara Sea can not be resolved from the available data, says the geophysicist. This requires seismometers, which are installed even closer to the source locaction, for example in boreholes. These were missing – yet. Bohnhoff and his colleagues from GFZ and other international partner institutes have set up such downhole instrumentation further east in the greater Istanbul area as part of the GONAF observatory (Geophysical Observatory at the North Anatolian Fault). They are designed to detect the ongoing deformation of the tectonic plates, tensions in the Earth's crust and vibrations very accurately and thus ultimately allow for a more realistic risk analysis for the upcoming strong earthquake at the gates of the mega-city. Basically, there the probability for a magnitude 7 or larger earthquake by the year 2040 is 35 to 70 percent. "The seismic hazard and risk for the metropolitan region of Istanbul does not necessarily change as a result of the new findings. But they must be included in various earthquake scenarios to make them more realistic," says Bohnhoff. "In this way, we also highlight an aspect hitherto completely ignored by the public, i.e. that the spatial proximity of the North Anatolian Fault Zone and the gas deposit poses an additional hazard potential." Due to the deposit large gas tanks are located at a short distance on land. In the case of a strong earthquake, there is an increased risk of explosion or gas leaks. Bohnhoff: "Such hazards increase the risk to the population of being damaged as a result of an earthquake."